Ceramic tile floors are long-lasting and durable surfaces capable of taking much abuse before showing the signs of damage. One of the first signs is a dull surface. Multiple tiny scratches and dirt on the surface cause this, breaking through the protective tile coating. Quick treatment will prevent deep gouges and cracks. Early treatment also helps brighten the tiles again, leaving a glossy finish that restores the appearance and adds additional protective coating to prevent further damage. Brighten ceramic floor tiles with a thorough washing followed by a light wax. Mix a batch of grout cleaner consisting of equal parts water and chlorine bleach in a small bucket. 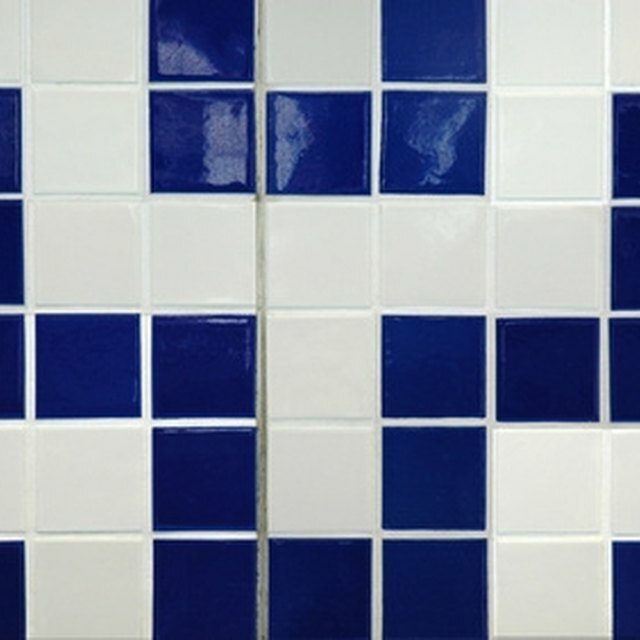 Apply the cleaner to the grout, using a small brush, and allow it to remain on the grout surface for 20 minutes. Scrub the grout with a nylon brush to remove ground-in dirt, and rinse the bleach mixture from the floor with a rope mop. Mix a cleaning solution in a bucket consisting of 1/4 cup mild detergent, 2 tbsp. trisodium phosphate and 1 gallon of water. Scrub the floor with an electric floor washer and the detergent mixture. Start in a corner of the room and work your way with the washer over the tiles. Use small, circular motions to cover the tiled surface with the washer, working in rows that overlap at the edges about 2 inches to ensure complete coverage. Rinse the floor with clean water, using a rope mop and taking care to rinse in a single direction only to avoid spreading the detergent over already rinsed areas. Pat the floor dry with a clean, dry cloth. Apply two layers of floor sealant onto the floor to prepare the surface for waxing. Use a mop to spread the sealant evenly across the floor surface, and allow the sealant to dry completely after each layer. Consult the manufacturer's instructions for recommended sealant drying time. Wax the floors to create a glossy shine and aid in cleaning. As with the sealant, apply the wax with a rope mop, spreading the wax evenly over the floor's surface. Allow the wax to dry thoroughly according to manufacturer's instructions.